BFG possesses a kind and caring heart and soul and it's impossible not to fall in love. The setting starts in an eerie looking orphanage on a dark, city street. A little girl wrapped in a blanket talks about the witching hour when people go missing. The brick buildings and cobblestone roads on a night when it's clearly rained, with a dark sky and birds flying overhead, set the stage for an impending dark and deep story. Disney absolutely knows how to bring Ronald Dahl's book "The BFG" to life, by ensuring that they had the best director at telling a children's story for adults directing it, Steven Spielberg (E.T. ), who also co-produced the movie. From the very beginning, Spielberg captivates his audience, as the curiosity of adults and children are piqued from the very onset of the film. The BFG is a story about a spunky little girl named Sophie (Ruby Barnhill) who is torn away from the orphanage by a giant. She thinks she's been captured by a monster when big friendly Giant "BFG" (Mark Rylance; Bridge of Spies) explains that she was taken to stop her from telling the whole world that she was a Giant. When she threatens to run away, BFG tries to explain that the bad Giants would come after her. The stage is set- BFG is clearly a lonely Giant- willing to talk and explain things to his new little companion. Sophie soon realizes that BFG is not the monster she thought. She realizes that he is friendly and lonely and an outcast from the Giants because he won't eat humans like the rest of the Giants. BFG introduces Sophie to his work - the magic of Dream Country, where he collects dreams and gives them to children. BFG possesses a kind and caring heart and soul and it's impossible not to fall in love with the way Rylance voices him and creates the character. Dahl developed his characters well and Melissa Mathison, who wrote the screenplay, carried the obvious relationship forward continuing the easiness between the characters. Watching the caring relationship develop between BFG and Sophie is like watching two people fall in love-magical and like a fantasy. When BFG feels like Sophie is in danger from the bad Giants, he takes her back home, to the orphanage, and you realize that despite the unorthodox relationship between the two, Sophie has found her forever home. Soon, it's BFG - with Sophie by his side- against the bad Giants. The two embark on a quest to London to ask Queen (Penelope Wilton; Downtown Abbey) to help them rid the world of bad Giants, once and for all. But, there's a catch- they must convince the Queen that Giants do exist and the interaction between Royalty and the simple Giant is quietly funny. The Blu-ray and digital download include bonus features not seen before in theaters. Bringing The BFG to Life: Listen to Ruby Barnhill, who pleads Sophie, share her experiences filming the movie, through video diaries. Spielberg also provides insight into how the film was made from beginning to end. Gobblefunk: The Wonderful Words of the BFG: Learn the unique vocabulary of the Giants that no one taught you in school. Melissa Mathieson: A Tribute: screenwriter Mathieson passed away and included in a tribute in memory of the late screenwriter. The Blu-ray is presented in MPEG-4 AVC with a 1080p resolution. The aspect ratio is 2.39:1. The blues of the night sky were brilliant and the dreams fluttering in the glasses were breathtaking. All this, contrasted with the gloominess of the night sky when the bad Giants were seen, provided a stunning visual effect of foreboding. What was stunning was that the combination of the live Sophie and animation of BFG and his world, is flawless in its presentation. The DTS-HD Master Audio 7.1 provides clear and crisp audio. The music blends well and does not overpower the dialogue. It's hard to tell in what year the story takes place. At first, it seems like an old-fashioned tale, but there are cars on the street- some that look like very early models to ones that look like the early 1980's, which would fit in with Dahl's writing. It seems like this is a story that should have taken place in the late 1800's or early 1900's- the tie of magic and fantasy - before the world become such a hard place to live. Clearly, not a flaw with Disney or Spielberg, it's more of a comment on Dahl's setting, itself. The BFG was not a box office hit in the US. With the combination of Disney and Spielberg, it is unclear what went wrong. The film is a little on the lengthy side, but it flows and doesn't seem to stall at any point. For small children, though, I can see them getting antsy. This is such a family friendly movie and caters to every age group that, despite some issues, The BFG Blu-ray belongs in every household. 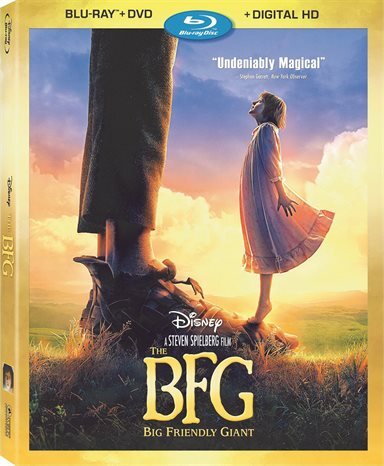 Download The BFG from the iTunes Store in Digial HD. For more information about The BFG visit the FlickDirect Movie Database.